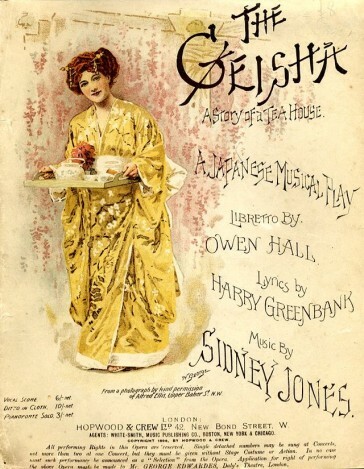 The most successful of the series of important musical plays produced by George Edwardes at Daly’s Theatre around the turn of the century, The Geisha not only proved to be one of the best-loved and most enduring of all 19th-century British musicals on its home territory, but also made its mark in a remarkable way beyond the English-speaking theatre world. It spread itself further abroad, and with more success, than any other previous English-language piece, not excepting the works of Gilbert and Sullivan, had done, becoming one of the most popular shows in Central Europe (Keller’s statistical survey of 1921 rates it behind only Die Fledermaus, Die lustige Witwe and Das Dreimäderlhaus) and remaining in the repertoire there until quite recently. Cover of the vocal score of “The Geisha”. British tar Reginald Fairfax (Hayden Coffin), on duty in the East, spends some time in the company of the geisha O Mimosa San (Marie Tempest), at the Teahouse of Ten Thousand Joys, run by the comical little Chinaman Wun-Hi (Huntley Wright). His worried fiancée Molly Seamore (Letty Lind) gets dressed up as a Japanese girl to see if she appeals to Reggie that way, but unfortunately she is trapped as a Jap when the local overlord Marquis Imari (Harry Monkhouse), determined to have Mimosa for himself, orders Wun-Hi’s establishment sold up. The wealthy Lady Constance Wynne (Maud Hobson) rescues Mimosa from his clutches in the subsequent auction, but the Marquis happily buys lot two instead — the disguised Molly. To prevent this wedding from taking place, Mimosa disguises herself as a fortune teller and predicts dire unhappiness for the superstitious Marquis in a life with an unloving wife and, when she is sent to bewitch Molly into a loving frame of mind, she instead uses the opportunity to substitute the teahouse’s eager little French interpreter, Juliette (Juliette Nesville) under the marquisal bridal canopy. Sidney Jones’s score was full of winning numbers, with the soprano rôle of Mimosa being equipped with a superb pair of waltz songs — one describing the less attractive side of `A Geisha’s Life’ and the other, in her fortune-teller’s disguise, singing of `Love, Love’ — as well as the rueful tale of what happened to `The Amorous Goldfish’ and a Kissing Duet with Fairfax. The other characters were also well served, with the highspots ranging from the comical antics of Wun-Hi in the enduring `Chin-chin-chinaman’ to Fairfax’s baritone ballad, `Star of My Soul’, Molly’s Japanese song `Chon-kina’, her anthropomorphic tale of `The Interfering Parrot’, and some delightful ensembles, including a first-act finale which gave the tenor playing Katana, Mimosa’s real Japanese beloved, his one chance to burst into song. Lionel Monckton supplied several additional numbers, scoring a hit with the baritone sea-song `Jack’s the Boy’ and also with the soubrette’s `The Toy Monkey’, whilst James Philp wrote the music to an interpolated piece called `The Jewel of Asia’ with which Marie Tempest scored a great success. The Geisha was a resounding London hit, running for 760 performances at Daly’s Theatre whilst the piece began to spread itself around, first, the British provinces and then the world. Edwardes had the first tour on the road within four months of the première, with Geraldine Ulmar, John Coates, Marie Studholme and Huntley Wright’s brother Bert featured, and Mouillot and Morrell simultaneously started out their number-two-towns company with Minnie Leverentz starred. A month later, Broadway got its first Geisha when Augustin Daly mounted the show at his theatre with Dorothy Morton (Mimosa), Van Rensselaer Wheeler (Fairfax), Violet Lloyd (Molly) and William Samson (Wun-Hi) and with a dancer called Isadora Duncan amongst the chorus. Daly’s repertoire schedule meant that the piece did not playa straight run, but The Geisha popped in and out of his theatre during the last months of 1896 and 1897, playing 194 Broadway performances (later with Nancy McIntosh as Mimosa and James T Powers as Wun-Hi) during that time, and becoming a great favourite. Such a favourite, indeed, that it won the honour of being the only musical to be granted a full-scale burlesque by the Weber and Fields team. Joseph Herbert’s The Geezer (October 1896) was one of the jolly house’s first and biggest burlesque hits. The Geisha was seen thereafter in every corner of America, and notably at the musical-theatre Mecca of the west coast, San Francisco’s Tivoli Opera House, where it ran up an unprecedented series of performances and was voted ‘more successful and attractive than any other piece produced at this house during the past ten years’. 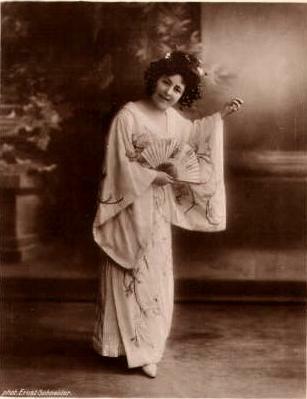 Mia Werber as the “Geisha”. Vienna picked up the Berlin version of the show, and Die Geisha was mounted at the Carltheater later in the same year with Frln Golz (Mimosa), Betty Stojan (Molly) and Sigmund Natzler (Wun-Hi) starred. As in America, it was not allowed a straight run, but alternated with a programme showing `The American Biograph’ and other Operetten of the theatre’s repertoire. It was, however, seen 28 times before the end of 1897 and was continued in the repertoire the following year with the peripatetic American soubrette Marie Halton featured as Mimosa, as it headed towards its 100th Viennese night (8 March 1900). Die Geisha was held seven years in the Carltheater repertoire, during which time Mizzi Günther played Mimosa and Louis Treumann took over as Wun-Hi, produced there again in 1912, and yet again in a new production in 1920 with Grete Seidlitz and Ernst Arnold (9 December, 175th night 31 December), as other Viennese and provincial houses took the show up and found it one of the most loved of all their presentations. The Geisha‘sGerman version ultimately proved as popular as and even more enduring than its English one, and the show was seen in Vienna again as recently as 1954 (Raimundtheater) and 1973 (Raimundtheater), with a new adaptation (ad Hans Herbert Pudor, Hermann Wetzlar) being mounted at Bremerhaven in 1956 (6 October). There was a similar kind of success for the Hungarian version of the show (ad Béla J Fái, Emil Makai), first seen at the Magyar Színház with Gizella Vlád playing Mimosa, Kornél Sziklai (Wuncsi) and Sári Fedák (Molly), which ran up its first 100 performances by 31 January 1899. Amongst the subsequent Budapest revivals was one at the Király Színház (12 April 1912) in which Fedák took the star rôle (the `title-rôle’ had been cleverly designed at the beginning to apply to either Miss Tempest or Miss Lind) alongside Márton Rátkai and Lilly Berky, and another at the F*o*városi Operettszinház in 1926 (11 February). The first French production of La Geisha (ad Charles Clairville, Antony Mars, Jacques Le Maire) with Jeanne Petit as Mimosa and Guyon fils as Mac-Chou-Li (ex-Wun-Hi) was a short-lived one, but the ubiquitous success of the show encouraged a second try and it was revived at the Moulin-Rouge, recently host to a spectacular if butchered version of The Belle of New York, 14 July 1906, with Jeanne Petit starring alongside Morton, Alberthal and Spinelly. 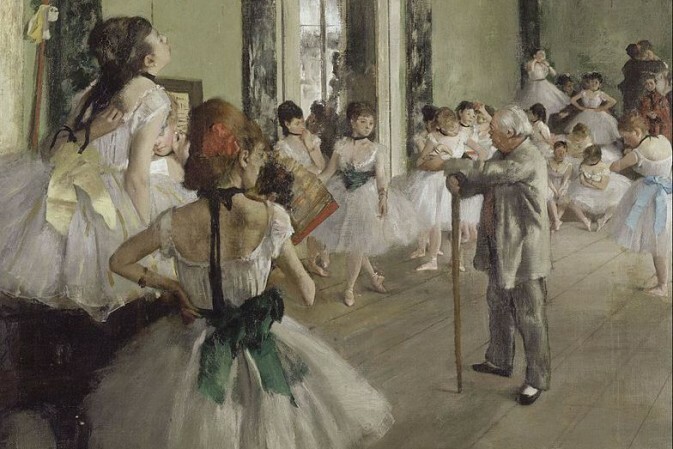 It was acclaimed ‘a masterpiece of its kind’ and ‘an ideal Parisian evening’ (!) and was played through the summer. A Gabriel Trarieux/Georges Bravard mounting followed in 1920 at the Gaîté-Lyrique with Opéra-Comique diva Marguerite Carré (Mimosa), Max Dearly (Imari) and Denise Grey (Zoe, ie Molly). However, in spite of this three-part Parisian life, La Geisha never found the enormous success of Die Geisha, A gésák or The Geisha. 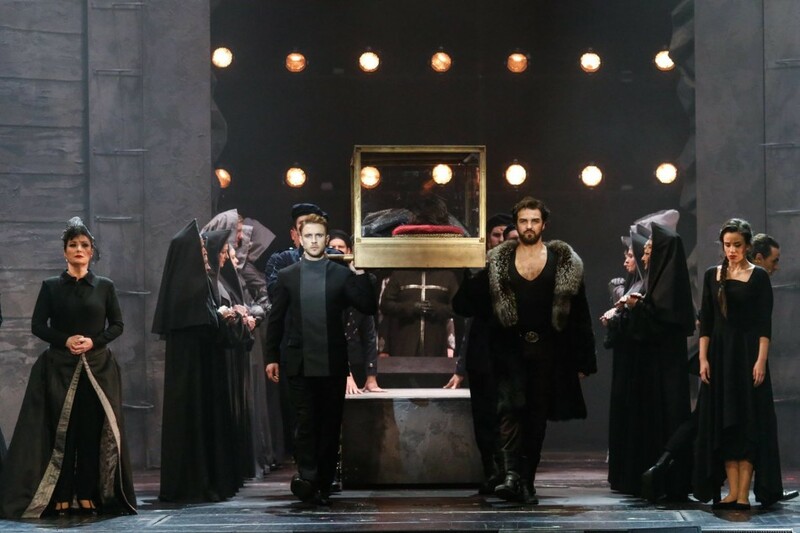 The show was produced throughout Europe, with notable success in Holland, Italy and in Spain, but with some problems in Russia, where it was given in a rather impromptu and approximate version. Ferenczy toured his Berlin version widely, including a long trip to South America, whilst J C Williamson and George Musgrove introduced Australia to The Geisha, and the Scandinavian countries produced adaptations in their various tongues. 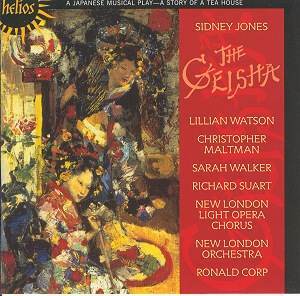 And, all this time, companies purveying the English-language Geisha flooded the touring circuits in Britain before the show returned to London in 1906 (18 June) when Edwardes produced a stop-gap mounting with May de Souza (Mimosa), Mariette Sully (Juliette), George Graves (Imari), Marie Studholme (Molly) and a third Wright brother, Fred Wright jr as Wun-Hi (60 performances). Cover of the modern “Geisha” recording on CD. The Shuberts mounted a 52-performance season of The Geisha in 1913 (27 March, 44th Street Theater) with Alice Zeppili, Lina Abarbanell and James T Powers featured, and several American companies mounted versions with with Japanese prima donnas: in 1919 Tamaki Miura starred in a San Francisco production and in 1931 the Civic Light Opera played a season with Hizi Koyke as Mimosa. The show was actually seen on Broadway for the last time shortly after this .. given by a touring marionette troupe in Italian! In the same year J Bannister Howard’s season of old favourites at London’s Daly’s Theatre included 48 performances of The Geisha, and there was a barely professional production at the Garrick Theatre in 1934 (24 April, 39 performances). However, whilst the piece continued in the Continental repertoire in the postwar years, British light-opera companies preferred to play adaptations of imported works and The Geisha finally dropped from the English-language lists.